Girls Who Code runs summer programs to teach high school girls about careers in computer science. Annika Lafyatis (center), '18, works in a group to develop and code a project aimed to bring awareness about climate change. Lafyatis (far right) with the group she spent a week programming robots with. Great news for students interested in computer science: it’s one of the hottest industries out there. Computer science majors are highly paid and highly in-demand. Bad news for women interested in computer science: far too often, Silicon Valley still subscribes to old-fashioned views about what a coder looks like. From Uber’s sexist board members to a Google employee claiming that “biological” differences between the sexes justify why women aren’t more represented in the field, it’s no wonder that only 18% of computer science majors are female. Fortunately, many companies are addressing the gender gap in computer science, Girls Who Code being one of the most famous. 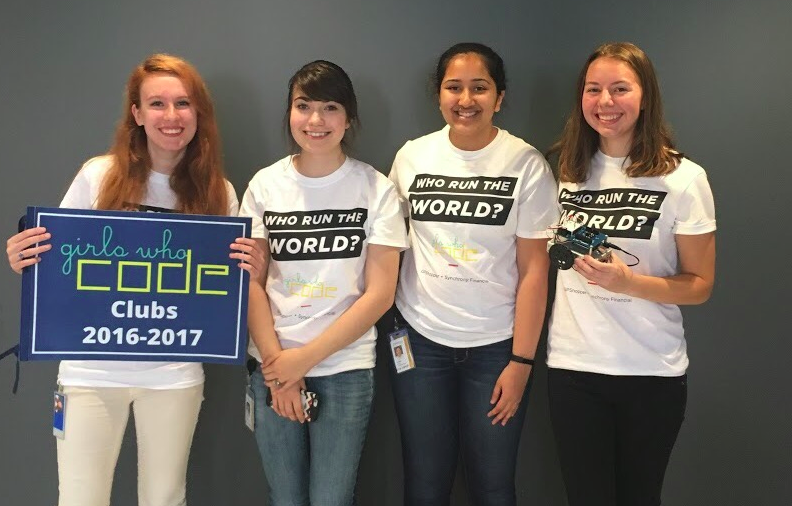 This summer, I was lucky enough to be part of a Girls Who Code Summer Immersion Program. 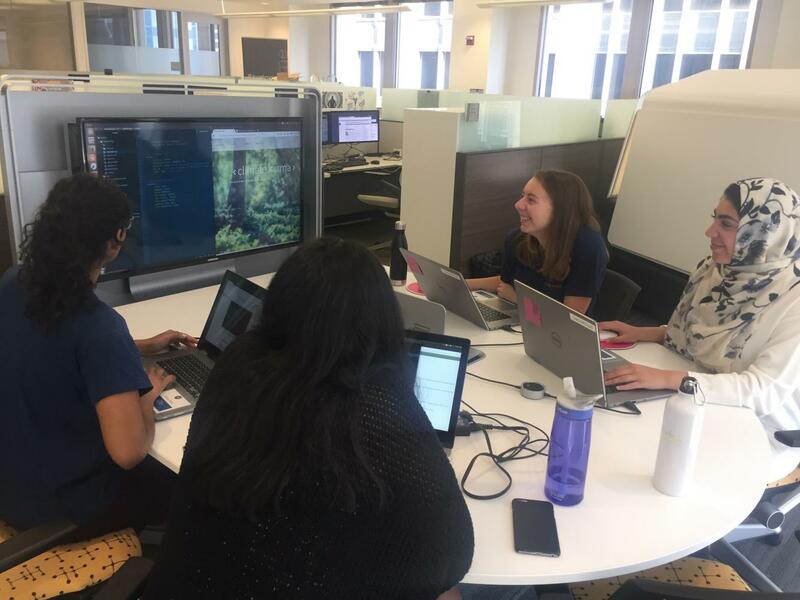 The Summer Immersion Program is a 7-week course that introduces a variety of topics in computer science to rising high school junior and senior girls. Class is five days a week for seven hours, taught by Girls Who Code staff. Each program is hosted by a tech company, which provides the classroom, computers, and other resources. Many well-known companies, including IBM and Google, host summer programs in several major cities. I applied after taking my first-ever computer science class junior year. I was pleasantly surprised to find that the application had nothing to do with grades or test scores. It didn’t even have to do with my knowledge of coding; girls with no experience were encouraged to apply. All I had to do was write a short response to one prompt. I was accepted to a class at Synchrony Financial in Chicago. I didn’t know exactly what to expect, but I soon found out that Girls Who Code provided a unique computer science experience. Most obviously, the program had a classroom of 20 girls. As our teacher pointed out, this would be the only time we were ever in a STEM class without any boys. The program emphasized sisterhood and teamwork. We all ate lunch together, and a lot of our activities were done with partners or small groups. Our classroom became very tight-knit group, and I know that my classmates are a network of people I’ll be able to get advice or support from for years to come. To my surprise, the program taught me far more than strictly how to code. We spent a lot of time researching, giving presentations, listening to guest speakers, and going on field trips to other companies. These experiences gave me a valuable glimpse into the life of a computer scientist. Finally, for the last week and a half of the program, we worked in groups of four to create coding projects of our choice. It was challenging in every aspect, from deciding on a viable idea to attempting to use unfamiliar languages. Our final product wasn’t perfect, but the experience of working with a team to create a real product was immensely satisfying. Girls Who Code taught me a lot about the ins and outs of being a female computer scientist, and I would encourage any sophomore and junior girls who are curious about coding to apply for the program. However, even if you aren’t able to participate in Girls Who Code, don’t be afraid to get involved in other ways. Conant has a robust curriculum of computer science courses and STEM-related clubs (such as WYSE, technology club, and robotics club), and the internet has a vast number of resources for beginning coders. So what I’m saying is: Girls, it’s not too late to learn computer science. You’ll probably be good at it, and you might really like it. Annika is a senior, and this is her fourth year on the Crier staff. 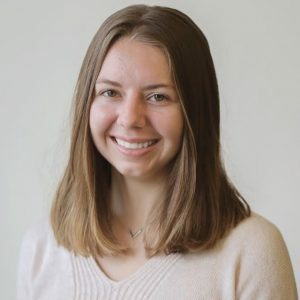 She is a co-Editor in Chief and has previously been the entertainment editor. She also plays soccer, and is a member of National Honor Society and BPA. Outside of school, Annika enjoys reading and volunteering at Petsmart.